Little Stevenson is starving. 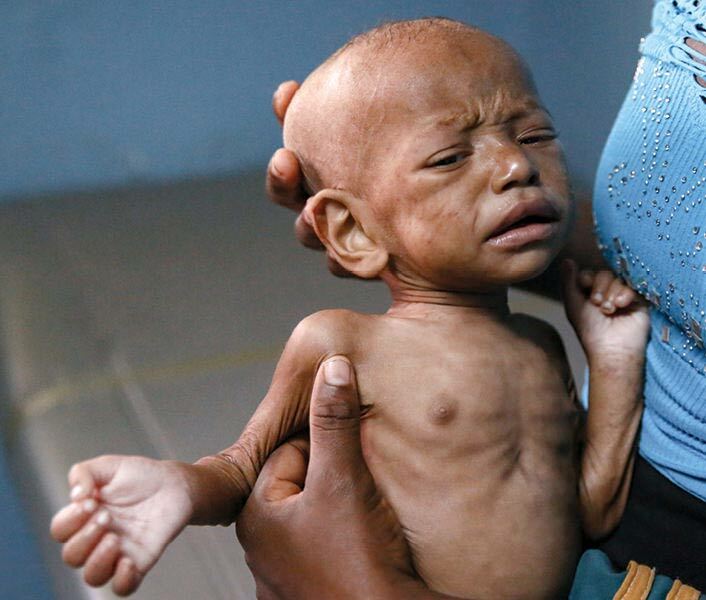 His mother, Maritania, doesn't know what she will feed her little boy. Stevenson is fighting malnutrition, and his mother doesn't want him to lose the battle and die. Stevenson weighs a little over 7 pounds. His tiny bones stick out like matchsticks. Skin sags off his little arms. He's too thin and weak to sit up on his own like other children his age. When Stevenson cries, his mother tries to comfort him by holding him. She relies on God, and trusts in His grace and mercy for her little boy. "I go to church. I ask God to heal my child," said Maritania. With just one dime you can help. Ten cents can provide a lifesaving meal for a starving child like Stevenson. Because Food For The Poor buys food supplies in bulk, your gift goes much further to deliver lifesaving shipments of nutritious food to hungry children. Please, won't you help feed a starving child like Stevenson today? Only 10 cents can provide a meal for a malnourished child. at dawn You will hear my cry." Little Stevenson is dangerously malnourished.